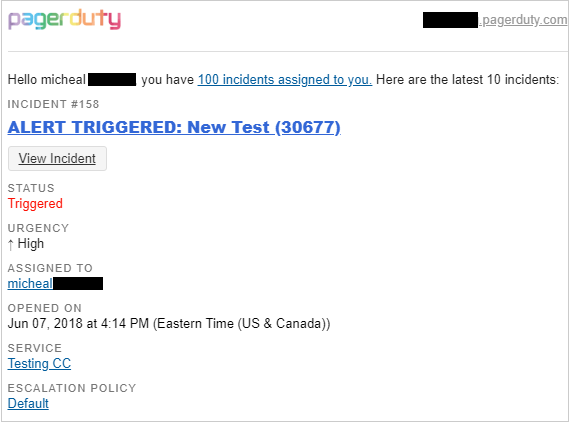 The integration with PagerDuty allows you to configure email notifications that you can receive daily or any time there is a change to a Best Practice Check or alert. To learn how to configure your integration with PagerDuty, review the procedure. From the left navigation bar, choose Account Settings > Integrations > Configurations. The Integration Configurations page opens. From the drop-down menu, select PagerDuty. Type the name of your PagerDuty account. A message indicates that your integration was created successfully. The page displays the new integration. Click (green plus sign) to review the details. A message indicates that your configuration was successful. To learn about other configuration options and to turn on alerts, review the topic, Integration Configuration: Understanding Other Options.